Grooma Groomer Brush is great to use while shampooing large dogs with a full coat. The 31 flexible rubber fingers reach deep into the pet's coat to remove dirt and loose hair. Provides a pleasant massage for dogs and cats! 3.5in diameter. Available in blue or purple. No color choice available. We never know which color we may have in stock. These brushes are made entirely from rubber. Used for removing dead hair, revitalizing the coat to it's shiny natural condition. Ideal for short haired breeds. 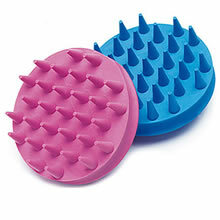 Can be used for removing loose hair while bathing or equally for the finishing touches.